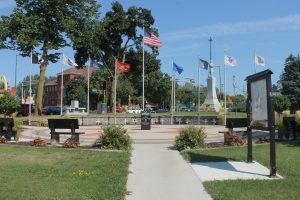 After years of planning and construction, the new Veteran’s Memorial Park Ring of Honor in Kaukauna, Wisconsin was dedicated on October 20, 2012. The completion of this Memorial was truly a community effort. Civic Engagement Class students from Kaukauna High School spearheaded this project and assisted in the design. They also did a great amount of fundraising to bring it to completion. Memorial stones were purchased by families to honor their individual heroes. Local veterans and members of the VFW Post were consulted and aided in guiding their work. The Memorial is referred to as the Ring of Honor. The stones have been emplaced in a huge circular ring in a concrete base. A large star is the center piece of the floor of the design. A marble podium is permanently attached to its center honoring all Veterans. Five large flag poles have been erected, along with one for the American flag. The entire Memorial is landscaped into a small hillside in the park. Hello everyone! I have received a few messages in regards to a Memorial Day service at the Ring of Honor. I contacted the city and their will be one held Monday, May 29, 2017 (Memorial Day), at 11:00 a.m.
Kaukauna Veterans Memorial Park updated their profile picture.